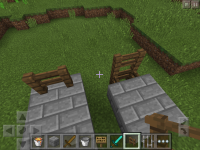 Players (and maybe mobs too) can jump over fences, cobblestone walls (and gates) when autojump is enabled when the entity is moving towards the fence/gate and autojump is triggered right before the fence. This also works every time you place soul sand inside a fenced area where the fencing is on solid blocks. Chests that are placed near the fence 1 block deep also allow the player to jump over the fence. (see 15 - 1.png and Screenshot_2016-03-29-01-39-32.png) The player sinks in the soul sand, autojump pulls them out and over the fence. Walking over a chest that is slightly in the ground allows the player to jump over the fence behind it. The soul sand method doesn't work for mobs. I expected that players and mobs could never jump fences. Attempts to reproduce by jumping without autojump enabled or where the fencing is on level ground have failed so far. The player doesn't need to jump (autojump does all the work). In Screenshot_2015-10-05-22-18-04.png, approach the fence at an angle as in the photo so the player falls into the pit a bit but autojump triggers. The player will clear the fence.